If anyone knows the importance of impact, it's Ken Shine. As president of the Institute of Medicine (now the National Academy of Medicine) from 1992 to 2002, Shine greatly raised the institution's national stature by ensuring that it undertook several high-level projects  many of which serve as a foundation for today's NAM. 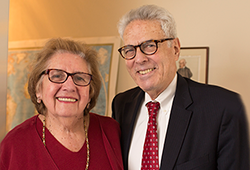 Now, along with his wife Carolyn, Shine is planning a generous bequest to the Harvey Fineberg Impact Fund. To understand why, says Shine, it's worth revisiting one of the IOM's most influential reports  To Err is Human: Building a Safer Health System. Initiated and released under his tenure, the report sparked a nationwide quality care movement that continues today. And more than 15 years since its publication, To Err is Human is still regularly cited by scholarly journals and popular news media alike. Given the report's impact, it may be surprising to learn that obtaining funding was a struggle. "When we approached foundations and government agencies, none of them were willing to fund such a project," said Shine, because of concerns about the potential risks of public criticism of the quality of health care in the U.S. Eventually, the IOM raised enough money to self-fund the project, along with financial support from the National Academy of Sciences. "This was one of those reports that had to be funded internally, but it had enormous impact. That's one of the reasons why giving to the Fineberg Fund makes excellent sense to us," says Shine. "In a way, it's an obligation to the people who do this outstanding work. We want to make sure that it's available at the right place and the right time, and in a format that is likely to influence how people think and behave."